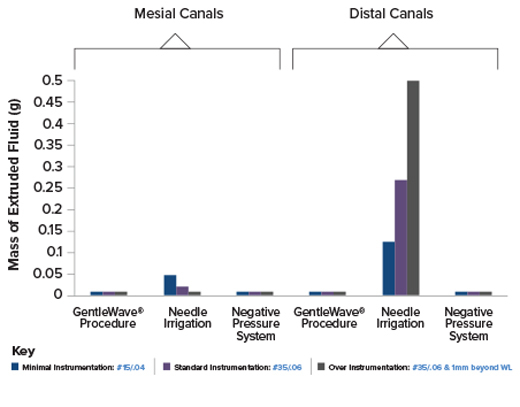 This study, published in the Journal of Endodontics (Vol 41; 2015), evaluated extrusion of irrigants during use of the GentleWave® System, standard open-ended 30-G needle, and a negative pressure system. Sixteen mandibular molars were mounted in an in-vitro apparatus. Roots were immersed in a pressure-regulated chamber that simulated periapical back pressure. The root canals were minimally and conventionally instrumented and treated with distilled water 5 times using the GentleWave System, needle irrigation and EndoVac. The mass (g) of extruded water was recorded. Statistical analysis was performed. The GentleWave System was compared with a negative pressure system and resulted in no apical extrusion.